Who are the Careers Team? The Careers Team is here to help you to make the right choices about your future. The service provided is accredited to the Matrix Standard Award for information, advice and guidance and the team were identified as a strength during a Matrix Inspection of Student Services in March 2018. What help can I get if I am a student? 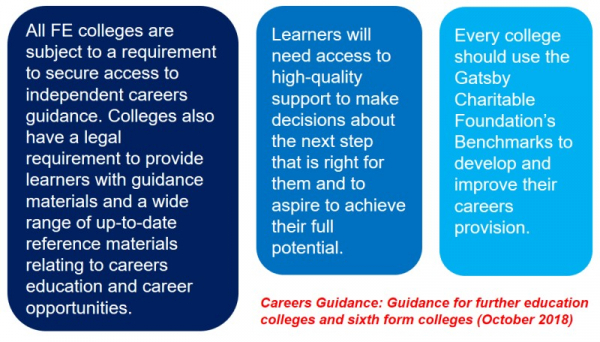 The CAREERS POLICY provides more detail about the careers support that you are entitled to receive during your time at Barnet and Southgate College. What help can I get if I am not a student but I need advice about courses at Barnet and Southgate College? Careers interviews with highly trained careers advisers (minimum of Level 6 careers qualification) via appointments to help you to choose the right course at Barnet and Southgate College. These appointments are available from September-June. Short drop-in sessions with careers advisers during enrolment (August/September) and college open days (throughout the year) to help you to choose the right course at Barnet and Southgate College. How can I get help from a careers adviser? Call 020 3764 4403 to book an appointment with a careers adviser or to get details about drop-in sessions. If you are a student, you can also come into the LRC at any of the main college campuses and request help from a careers adviser. How do I do my own careers research? If you would like to do your own research into topics such as careers, courses, apprenticeships, voluntary work, self-employment and the job market including salaries and areas of skills shortages, there are lots of good websites around to help you. This list shows some of these websites. This is not a complete list of all the websites available but hopefully, it gives you a few places to start!